So far, you’ve met our Top Dog and our Leader of the Pack. Today we’d like to introduce you to another integral part of the Camp Bow Wow family – Steve Ricard, our Vice President of Technology, aka our Tech Dog. Steve is in charge of all things tech, hence his catchy nickname! His day-to-day responsibilities include overseeing the technology team, implementing digital strategy and integrating innovative new ideas across all franchise departments. In short, our franchise system would not be able to function accurately if it weren’t for the efforts put forth by Steve and his team. For that reason, we’re fur-ever grateful! Steve’s most notable contributions to the Camp Bow Wow franchise to date were the development of Camp Bow Wow’s point of sale system and quality assurance tools – both of which are now shared by all franchises nationwide. If it seems like Steve has been a part of the Pack for quite some time, that’s because he has! In fact, he started out as a Camp Counselor in 2001, when the first Camp opened its doors. From his first day, his leadership qualities were undeniable, and it wasn’t long before Steve began furthering his career with the Pack. During his tenure with Camp Bow Wow, Steve has held a variety of management positions, including overseeing new business operations, both at the corporate level and at franchises across the country. All that said, it’s safe to say we don’t know where we’d be without him! As a Camp veteran, and long time dog-lover, Steve is proud of his history with Camp Bow Wow. 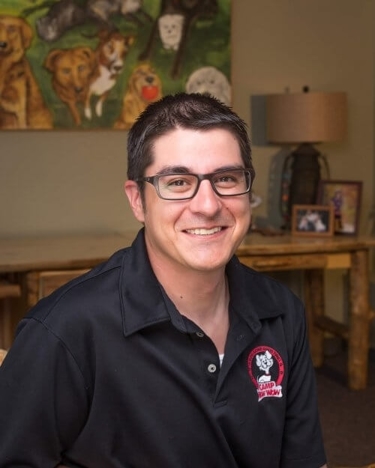 When he’s not working hard on creating the best possible experience for owners and their pets, he’s at home enjoying time with his son, Noah and his two fur-children, a Great Dane and a Newfoundland. For more information about Steve and the rest of the Camp Bow Wow Leadership Team, click here. And remember, we’re always looking for new franchisees to come set up Camp! To learn more about our available markets, and what it means to be a part of the Camp Bow Wow Pack, fill out the form below to request a free executive summary.